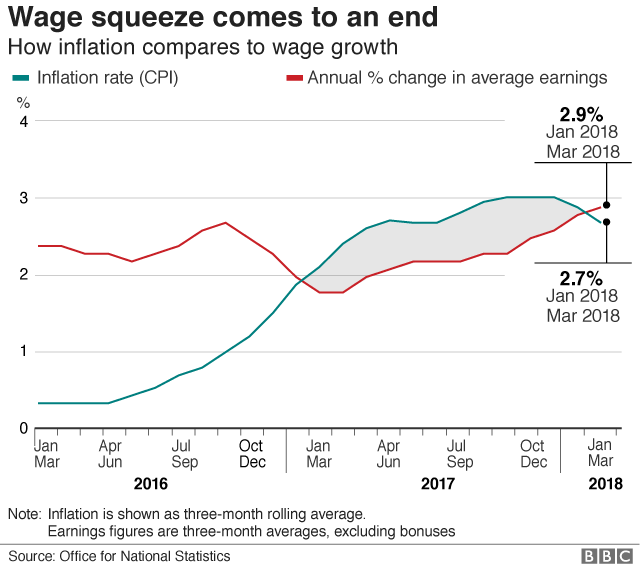 Wages rose at an annual rate of 2.9% in the three months to March, faster than inflation for the first time in more than a year, official figures show. Over the same three-month period, the inflation rate was 2.7%. also said unemployment fell by 46,000 to 1.42 million, with the jobless rate falling to 4.2% the lowest since 1975. The Chancellor, Philip Hammond said: "Growth in real wages means that people are starting to feel the benefit of more money in their pockets; another turning point as we build a stronger, fairer economy. "The unemployment rate is at it's lowest in over 40 years and with our National Living Wage we are making sure that the lowest-paid feel the benefit with an extra 2,000 a year." However, the general secretary of the TUC, Frances O'Grady said: "Working people are still not getting a fair deal. Millions of jobs do not pay a real living wage. And average weekly pay is still worth much less than a decade ago." John Hawksworth, chief economist at PwC said: "The rise in wages will be helpful as it follows a long period when wages have been falling relative to inflation, but wages are still lower in real terms than they were before the financial crisis. and this won't turn round things overnight." The number of people in work increased by 197,000 in the January-to-March period to 32.3 million. The ONS said that 75.6% of people aged from 16 to 64 years were now in work, the highest since records began in 1971.